A GSS is a suite of collaborative software tools that can be used to focus and structure a team’s deliberation while reducing cognitive costs of communication and information access and minimizing distraction among teams working collaboratively toward a goal. The issue with big GSS is that they are mostly fairly expensive. GSS have great potential but surveys show that they very often do not diffuse beyond the initial installation. GSS facilities are self-extinguishing. The paper explains why GSS diffuses so slow and what other approaches there are (self-sustaining… – wait for it: ThinkLets). The paper uses TTM (Technology Transition Model) to explain why GSS is self-extinguishing and introduces ThinkLets as a “better” concept. The paper mentions five theories and models. TTM does not want to replace TAM or the Innovation Attributes. Rather, TTM builds on these preceding models. The whole discussion about GSS Technology Transition in this paper explains why companies fail to successfully use GSS (why it is so difficult). The first reasons lies in the TTM’s dimension of perceived net value from system use; high conceptual load; what is the system supposed to do? GSS facilities need highly skilled facilitators. For economic and political reasons it’s hard to keep those high-quality people. GSS has great potential for companies. So what to do? Focus on few features of GSS. Concentrate on a fraction of the capabilities provided by GSS to make it a routine and increase effectiveness and efficiency. Having a standard collaboration process (with GSS) makes it easier for people to use the system > lowers conceptual load > increases perceived net value combined with a higher perceived frequency of net value. Do not focus solely on “general purpose” facilities. Rather, focus on creating solutions for mission-critical collaborative tasks that recur frequently. Do not rely on skilled general purpose facilitators for long-term GSS success. Rather, have these people design effective collaborative processes, and train “practitioners” to run them. What is collaboration engineering? The smart facilitator designs the mission-critical collaborative processes to minimize the practitioner’s cognitive load, transfers the relevant facilitation skills and knowledgeabout GSS and group dynamics. A thinkLet constitutes the smallest unit of intellectual capital required to create one repeatable, predictable pattern of collaboration among people working toward a goal. Key statement here is that you can break down collaborative work processes and design them as thinkLets, so that they become modular, reusable, and easy to understand. Example: Risk and Control Self-Assessment (R&CSA) workshops. Collaborative work is not easy. Facilitators are expensive and often headhunted for other company tasks. Therefore, GSS are often discontinued. Designs with thinkLets facilitate collaborative work, make collaborative processes easier to understand and to execute, and are designed to be reusable. The paper argues that the focus on GSS support for repeatable (distributed) mission-critical collaborative processes represents a promising avenue to pursue self-sustaining communities of GSS users. ThinkLets are a way to package facilitation skills. 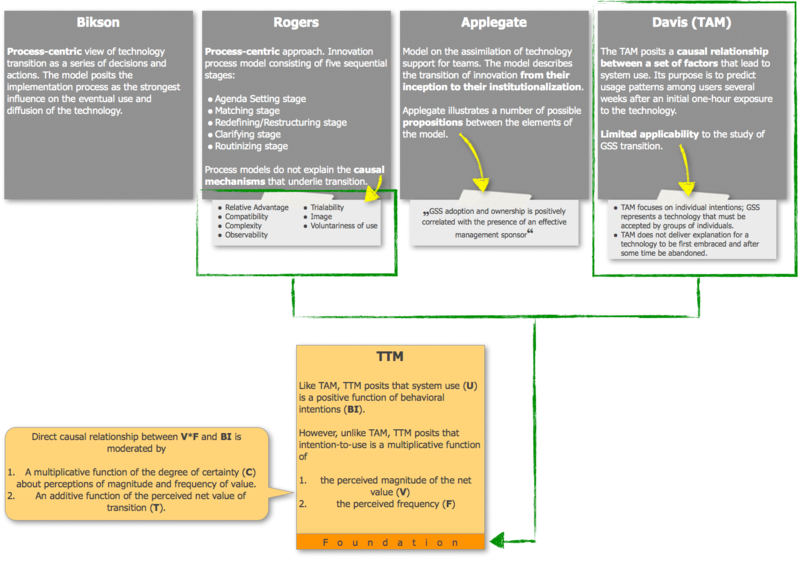 ThinkLets define the facilitator’s actions and prompts in a step-by-step fashion. Companies must identify their critical repeatable processes that are frequently carried out by groups of practitioners. Facilitators can use their experience and skills as collaboration engineers to create custom collaborative processes for practitioners (which leads to a self-sustaining community of GSS users). Focus on the thinkLet, rather than on the GSS can lead to a fundamental shift in the structure and purpose of the GSS. Organizations mostly cannot have enough capable facilitators. Distributed collaborative processes “must” be run by practitioners. TTM (as the basis for the paper’s argument) has been substantiated by a still relatively limited number of field cases and observations. A thinkLet is not a mechanistic guarantee for repeatable results. Briggs, R. O., Vreede, G.-J. & Nunamaker, J. F. (2003): Collaboration Engineering with ThinkLets to Pursue Sustained Success with Group Support Systems. Journal of Management Information Systems 19(4). 31-64.